And, I know I’m not the only one. I bet most of you experience dry or itchy skin during the winter. And, it’s no fun. All women want to look beautiful, especially during the winter months when it’s less than beautiful outside. Here’s some good news, though. Last year, I purchased the book Return to Beauty: Old-World Recipes for Great Radient Skin, by Narine Nikogosian. This book is incredible; it’s filled with amazing skin care recipes that use ingredients you already have in your kitchen. I’ve been using recipes from this book regularly for the past six months, and I’ve gotten religious about it since winter started. And you know what? My skin has never, ever, looked better. Using the recipes from “Return to Beauty” has made an enormous difference to me on many levels. First, I don’t ever put anything on my face that I would not also put in my mouth. Our skin doesn’t need to be coated in chemicals we can’t pronounce. Women have been using these recipes to take care of their skin for centuries, and they work for a reason! They’re simple, wholesome, and very good for you. I also really love making these recipes morning and night. I know at first it seems like a hassle, but it’s actually become part of my routine, and it’s like a meditation. Plus, all I really have to whip up is the face wash; I make the moisturizer in a large batch, so I only have to make that every 7-10 days. So, which recipes have I fallen in love with? I’ll list my two favorites below because they’ve been so effective. However, I’ve now tried almost a dozen recipes in this book and they’ve all been fabulous. Whether you have oily skin, dry skin, combination skin, or mature skin, you’ll find dozens of recipes that will help you look more beautiful. Now, on to my daily beauty routine! Add ingredients in small bowl and heat in microwave for 3-5 seconds (to soften honey). Mix well. Scrub with face, and then rinse with warm water. 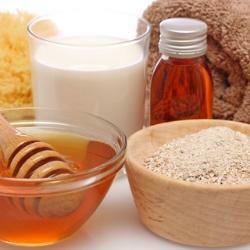 Heat honey for 3-5 seconds to soften, then stir in baking soda and vegetable oil. Mix well. Use as a moisturizer; put on face, let sit for a few minutes, then rinse with warm water. Note: This recipe is my own modification from the book (which instructs you to add 1/4 cup water). I’ve found that I really like this thicker version, and my skin likes it too! I usually quadruple this recipe to make enough for a week or two. As I mentioned, I use these two recipes morning and night, and my skin has never looked better. It’s glowing! I highly recommend you pick up the book, “Return to Beauty”; there are gorgeous photographs, and tons of wonderful recipes to take care of your scalp on down to your toes. And, all of them are healthy and 100% natural!